This file photo taken on March 29, 2010 shows a man walking past a sculpture by British artist Damien Hirst, "Away From The Flock" at the Oceanography Museum in Monaco. Iconic works of art by British artist Damien Hirst involving dead animals preserved in giant tanks leaked potentially-dangerous formaldehyde gas during a show at London's Tate Modern gallery, it emerged on April 20, 2016. VALERY HACHE / AFP. LONDON (AFP).- Iconic works of art by British artist Damien Hirst involving dead animals preserved in giant tanks leaked potentially-dangerous formaldehyde gas during a show at London's Tate Modern gallery, it emerged Wednesday. Scientists testing a new sensor for the remote detection of the carcinogenic gas in the 2012 exhibition found levels above those legally permitted, according to a study in the monthly journal Analytical Methods. But they insisted they did not believe their findings showed there was a risk to the public at one of Britain's most popular attractions, visited by 5.8 million people in 2014. "It has been found that the tanks are surrounded by formaldehyde fumes, constantly exuded in the atmosphere (likely via the sealant), reaching levels of five ppm (parts per million), one order of magnitude higher than the 0.5 ppm limit set up by legislation," the journal abstract states. 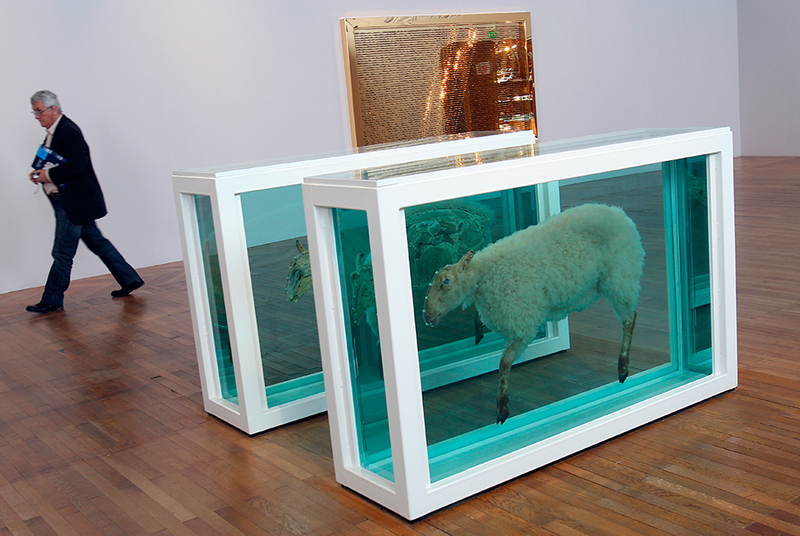 One work that emitted high levels was "Away from the Flock", a 1994 exhibit showing a lamb preserved in formaldehyde solution in a glass and steel box. Gas was also detected around "Mother and Child (Divided)", a 1993 work which comprises four boxes containing a calf and cow, each bisected, although the exact level was not written in the journal article. "Tate always puts the safety of its staff and visitors first, and we take all necessary precautions when installing and displaying our exhibitions," a spokesman for the Tate Modern said. "These works contained a very dilute formaldehyde solution that was contained within sealed tanks." Hirst's representatives had no immediate response to the study which was led by Pier Giorgio Righetti at the Politecnico di Milano in Italy. In a statement, Righetti said the research "was intended to test the uses of a new sensor for measuring formaldehyde fumes and we do not believe that our findings suggest any risk to visitors at Tate Modern".